The Italian campaign wasn’t to be successful this year: just like a few weeks ago at Misano in the Sprint Cup, the Belgian Audi Club Team WRT had a frustrating weekend in Monza for the season-opener of the Endurance Cup. In Lombardy too, the team had to face drama from the beginning, as the car of Berthon-Richelmi-Tréluyer had to be withdrawn after it was hit from the back in the first lap of qualifying. Another car, the one of Fässler-Stevens-Vanthoor was put out of contention by the consequences of the massive crash at the start. The two other cars of the team could finish the race, climbing back positions to take P12 (Dennis-Leonard-Winkelhock) and P24 (Caygill-Mayr Melnhof-Venter). A frustrating weekend because the Audis R8 LMS proved to deserve much better and a difficult start of the season that the team is determined to correct as from the next rounds in England. From the start of the weekend, it was clear that competition, with 53 cars on rack, was going to be extremely close, as proven by the result of the combined qualifying, which saw no less than 32 cars within a second! In a power track such as Monza, the Audis R8 LMS did relatively well, with car #5 of Fässler-Stevens-Vanthoor being in the top 4 in free practice and pre-qualifying. Qualifying proved to be a more difficult exercise, as expected, and started with total drama for the Belgian Audi Club Team WRT: Berthon got hit from the back by the Lambo of Filippi, who missed his braking, in the very opening lap of the session. The consequences for car #2 were catastrophic, with damages to the chassis, which meant ‘weekend over’. Car #5 eventually qualified in P20, although only 6 tenths from the pole, with car #17 in P33 and car #3 in P47. For the two surviving Audis of the Belgian squad it was a catch-up race. In car #17, Markus Winkelhock did a good stint, running among the top 18, but lost some positions after a spin at the first chicane caused by a contact from the back. The car performed an early and perfect pit stop, with Stuart Leonard going back to the track in P17 and gaining ground during his stint. The young Jake Dennis finished the race strongly, climbing some more positions to finish 12th and very close to the points. Car #3 performed an even bigger come-back, benefitting at the beginning from the numerous retirements. Niki Mayr-Melnhof managed to get in in the top 25 during his stint, with the car gaining four positions more during the pit stop. Jon Venter and Josh Caygill, in their first outing in the Endurance Cup, had to battle hard in the most crowded part of the field, and did it well, the car crossing the line in P24. 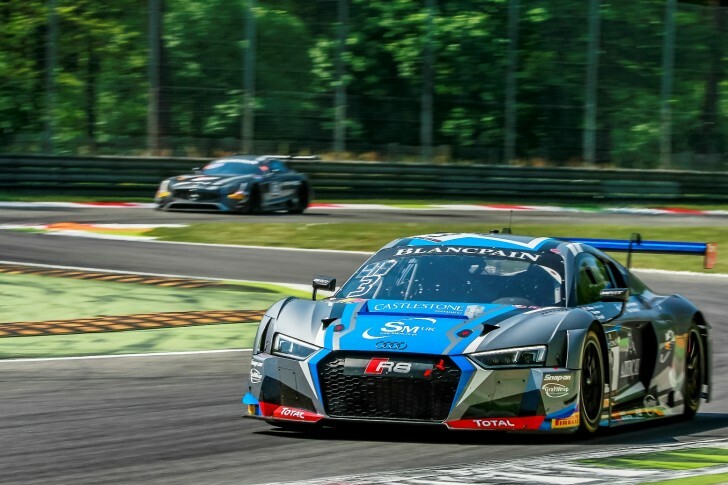 The Blancpain GT Series will continue now with the UK campaign, with the Sprint Cup race at Brands Hatch on 6-7 May and the Endurance Cup round at Silverstone one week later.